I had the pleasure of writing a guest article for my good friend Charlie Paparelli’s blog. The topic is knowing your milestones. Read it here. Charlie asked me to cover his blog while he was on a mission trip to speak at the Kampala International Christian Center’s Youth Ablaze Conference. His topic was “Igniting Kingdom Minded Entrepreneurs.” They couldn’t have picked a better keynote speaker for this topic. Charlie is a great friend and I am blessed to have him as both a professional and life mentor. His personal mission is “helping entrepreneurs take the next step in business and in life.” It’s perfect for him. That’s exactly what he did for me, and was instrumental in helping me take my ‘next step’ and launch Tech Square Ventures. Charlie’s unique gift is his ability to love everyone. This stems from his deep faith and is what makes him such a great business and life coach. He doesn’t let you hide from the tough questions and will tell it like it is – but you know without a doubt when talking to him he genuinely cares about you. If you are building a startup and don’t already follow his blog, I highly recommend you start. He holds office hours and runs Angel Lounge at ATDC. Countless Atlanta entrepreneurs and angel investors have benefited from his experience as an entrepreneur and angel investor in over 20 startups. I’m thankful to be one of them. Venture Atlanta will be here before you know it. Each year, the VA Selection Committee selects 30 or so companies (from 100′s of applicants) to present at the premier technology conference and largest investor showcase in the Southeast. If your company is looking to raise money – now is the time to get your application in to present. The goal of the conference is to help seed, early, and growth stage companies get funded. Any technology enabled startup is qualified to apply, however the conference doesn’t cover bio, pharma, life sciences, or medical devices. Building on the success of last year’s Southeast Spotlight, Venture Atlanta is seeking applicants from Georgia and across the Southeast. Last year we sold out with more than 800 people in attendance. 60 funds and over 100 investors from all over the country were in the audience. Dozens of large companies attend as well. Access to local and out-of-state venture fund groups through one on one meetings. Last year, over 250 meetings took place at the event, resulting in many term sheets. Some companies had over 20 one-on-one meetings. Presenting companies have many networking opportunities, including invitations to private meetings and dinners. The benefits don’t end with the conference. VA continues to provide opportunities for alumni companies – and we’re adding a new benefit for alumni that we’ll be announcing soon. Today we had our second Selection Committee meeting for 2015. The committee members review every application. Each one gives the company a rating and they are later discussed at Selection Committee meetings. The committee members put many hours into reviewing the applications. In past years, many startups wait until the deadline to submit and those applications. The flood of applications close to the deadline means the have to be reviewed quickly and it is harder to stand out. Unless you think something will change before the deadline that will demonstrate significantly more progress or traction – you’ll be better off applying early. You probably know someone on the Selection Committee or work with one of the sponsors. If you don’t, make an effort to. Let them know you applied and update them on your company and progress so they can advocate for you while your application is being reviewed. Last year I noticed many applicants benefit because someone knows the company and shares with the rest of us why they should be invited. Have a ‘spy’ on the Selection Committee and update them on your company. Applying is easy – just go to http://ventureatlanta.org/conference/apply/ and submit your executive summary. What is NOT easy is creating a great executive summary – but that’s what it will take to get selected. Highlight the good stuff and make it awesome! A good executive summary is content rich and uses simple sentence structure. It clearly articulates what the company does and whom they do it for. Help the committee understand your market opportunity, product, technology, and target customer. Make sure it shares your competitive advantages, what stage your startup is, your revenue if you have any, when you will be seeking funding, and highlights traction and customer adoption. Some of the best companies may not get a chance to present because the committee can’t tell what you do from your executive summary! If it’s long on marketing speak and hype, but short on clear descriptions and specifics – it won’t get good ratings and won’t be selected. Do not assume the committee members know your company or your industry. Spell it out for the committee and get help from a mentor, seasoned entrepreneur, past presenter, or one of the startup organizations (like ATDC, Startup Chicks, ATV, VentureLab, etc) before you submit. VA is looking for fundable companies that excite investors – use your executive summary to show why that’s you. If you have presented at VA in the past and you are raising money again, you can still apply to present. However, it is critical that you highlight what progress you’ve made since then to get selected. If you have presented in the past, tell the committee what you’ve accomplished since then. I’m honored to be this year’s Venture Atlanta Chairman. The conference is October 20-21 at the Georgia Aquarium. The Board of VA has worked hard all year putting together a great conference and I can’t wait to share the details and some of the new things we are doing this year. Presenting at Venture Atlanta is a terrific opportunity. You’ll gain exposure to top VCs from across the country, benefit from experienced coaches, get practice pitching your company, and get quality networking opportunities. The application deadline this year is August 14th (see tip #1). Good luck! I was reading Ben Dyer’s ‘Where Do You Work?‘ essay on TechDrawl today and his comments about being asked for introductions to investors after passing on a deal. The article reminded me of a time in high school when my brother called a young woman named Dana and asked her to a school dance. She politely turned him down. Undeterred, Mark quickly followed up with “put your sister on the phone”. As you would expect, he didn’t fare any better with her sister. Like my brother’s flawed strategy to find a date to his dance and as Ben highlights in his blog, an introduction from an investor that passed on a deal probably won’t lead to success. The article led me to think about what I tell Atlanta entrepreneurs that ask me for similar introductions. 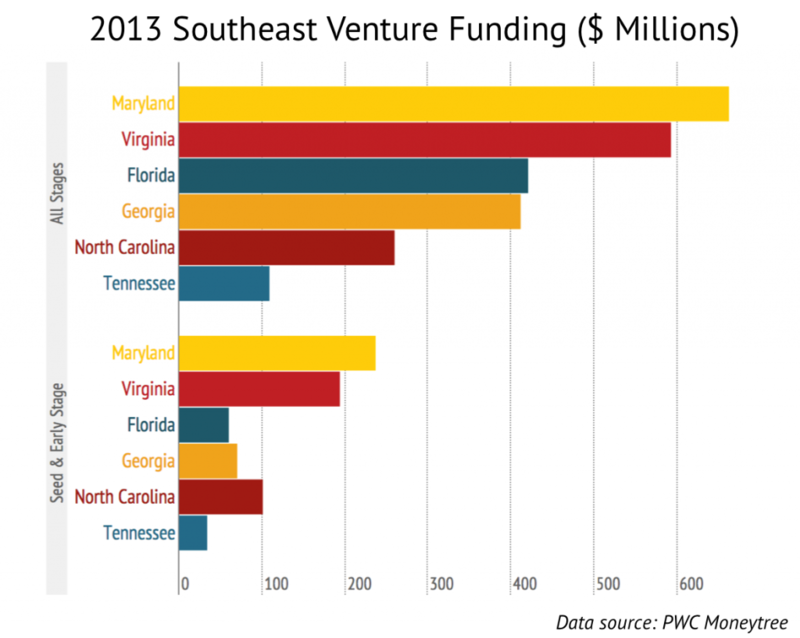 The Southeast is an underserved market for capital and it can be hard to get the attention of the active investors in town that are busy looking at other companies and helping their current portfolio. Hands down, the best way to get their attention is an introduction from another successful entrepreneur. Investors value those relationships and opinions. They will almost always agree to meet with an introduction from an entrepreneur they respect. So get out and network with other entrepreneurs. Move into a co-working space like Atlanta Tech Village. Attend one of the many startup events in town each month. ATDC’s mission is helping Georgia’s entrepreneurs. Book office hours with ATDC EIRs (entrepreneurs-in-residence). Take the classes on raising funding. Get paired up with a mentor through the mentor program. The ATDC team has relationships with most of the investors in town and can help identify the ones that are the best fit for your deal – and get you ready for your pitch. The same goes for many of the other 20+ startup organizations in town. If you are one of the ‘newly minted graduates’ or ‘40+’ entrepreneurs that Ben talks about in his blog that doesn’t have a network of investors that have seen you perform, ATA is a good place to start. Each month they screen dozens of startups and select 3 to 5 to present to their angel group. If your presentation generates interest, they’ll assign a team that will dig deeper and coordinate with those members interested in the deal. ATA has been very active in recent years. Visit the ATA site to learn more about their process and what types of companies they fund. SIG is another active investor group composed of partners from VC funds in the Southeast, corporate venture funds, and angel investors. Each month they screen and select 2 or 3 companies to present to the group. SIG typically looks for companies that are past the friends and family rounds and up through series A & B rounds. Some of the sectors they invite include: IT, Cloud systems, network security, communications, wireless, media, healthcare IT, financial processing, data processing, and logistics among others. 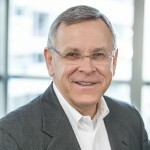 The best way to get an opportunity to present to SIG is through one of their members, or by connecting with Martin Tilson. There are no shortage of pitch events in Atlanta – Venture Atlanta, Atlanta Startup Village, Startup Riot, TAG Business Launch, etc. Applying to pitch at these events is a great way to get in front of investors. Even if you aren’t pitching, you should attend and network with the other entrepreneurs and investors at the event. Flashpoint is an accelerator program that takes founders through an intense customer discovery program they call ‘startup engineering’ and gets them ready to raise the funding they need to succeed. Each cohort concludes with a demo day where the startups meet dozens of investors. Raising money is hard work. It won’t happen by blasting out cold emails to investors, and probably won’t come from an introduction from someone that has passed on your deal. If you are looking for investors for your startup in Atlanta, leverage your network and consider the resources listed above. Friday’s Leadership in High Growth Startups event hosted by ATDC and High Tech Ministries was perhaps the best, most meaningful startup leadership talk I’ve seen all year. The speaker was Elijah Sebuchu, a Pastor from Uganda. He shared his story and the leadership lessons he learned building his own high growth startup – Hands of Love. If you missed it – you can listen to his talk HERE. Elijah was born in a swamp in Uganda as one of 38 children in a polygamous family. He was born into poverty most of us can’t imagine. He didn’t have a blanket until he was 13. He didn’t own a pair of shoes until he was 15. His name, Sebuchu, was chosen in a ritual where hens are given names and tossed in the air. The first to touch down became his name. Sebuchu means “great leader” – and from a very young age Elijah’s Mom told him he would become a great leader. He was one of the few fortunate that was afforded an education. He went on to get a degree from a local seminary and launched his ministry. As he grew his ministry in a country ravaged by war and HIV, Elijah and his wife Ruth were drawn to the plight of the countless orphans wandering the streets and countryside that had lost their parents. With only $10 to his name, they walked miles to a plot of 5 acres in a remote part of Uganda where they used a machete they were given and their bare hands to build mud huts. With 70% of the country under the age of 24, his vision was to help feed, clothe, shelter, love, and educate these children who had no one to care for them. Two weeks later, 180 kids showed up and his orphanage was born! Elijah and Ruth found themselves with 180 kids, a few mud huts, and no resources. Elijah remembered his mother often told him “relationships are better than meat.” So he began to reach out to people for help on the internet and was connected to a caring German man that put him in contact with a wealthy individual from the UK. This person offered to buy him a home and a car. He told them he didn’t need either – what he needed was introductions to the man’s network. Those relationships led to the founding of Hands of Love, the foundation that supports their work. Use relationships and your network to tap into resources to grow your company. Relationships will provide the ideas, knowledge, and resources to take your startup to greater heights. When one of the children in the orphanage reached high school age, she asked Elijah and Ruth for a job at the orphanage. He told her they had nothing to pay her with. This remarkable young woman decided to stay and work for free. She became employee #3. They later used some of the money they raised to send her to college. As she was the first female to graduate in her region, thousands of people showed up for her graduation. She received multiple job offers and people even sent her money. She turned them all down, telling them she was born to work at the orphanage. Your vision is what motivates people. In a country with 70% unemployment, Elijah’s vision inspired that young woman and many others, including some with advanced degrees, to work for 10% of what they might earn elsewhere. Another child of the orphanage went on to graduate college and earn an advanced degree. She had job offers for six figure salaries, but instead chose to return to the orphanage to work for only $350 per month – telling Elijah and Ruth that she would leave “only in death”. This woman went on to help build the foundation that funds their activities. He shared a story of travelling to the United States for the first time to speak in Los Angeles. When he was alone in his hotel, he found himself virtually paralyzed by what he was seeing. “What is this?” Coming from abject poverty and a country ravaged by war and AIDS, at first he couldn’t bring himself to eat or even sleep in the bed. He was introduced to Pastor Rick Warren, who asked how he could help. Elijah’s request was tell him one thing he could do to grow his orphanage. Pastor Warren told him “keep learning”. Elijah’s vision and love has “captivated Uganda and taken Africa by storm.” When Elijah prays, he said he prays for relationships. His prayers are being answered. Through the help of others his organization has grown to over 300 employees that support 1426 children in their orphanage and schools. He has become a well-known leader and speaker across Africa. And today, he does have a home and a car. As his mom predicted, Pastor Elijah has certainly become a great leader! 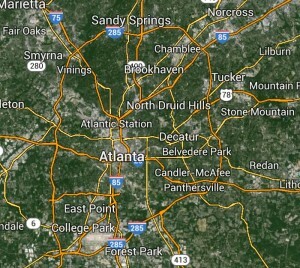 Hands of Love’s US foundation is located right here in Atlanta. I encourage you to visit http://www.handsofloveusa.org/ to learn more and see how you can help. Entrepreneurs building technology startups need more than an idea and a great team. Unless you have deep pockets or wealthy relatives, chances are you will require outside investment to turn your passion into a high-growth success. That’s where venture capital comes in. VC firms are professional managers of risk capital that fund new innovations by investing in promising early-stage companies. These companies aren’t at the stage where it’s possible to secure traditional bank loans or raise money in the public markets. 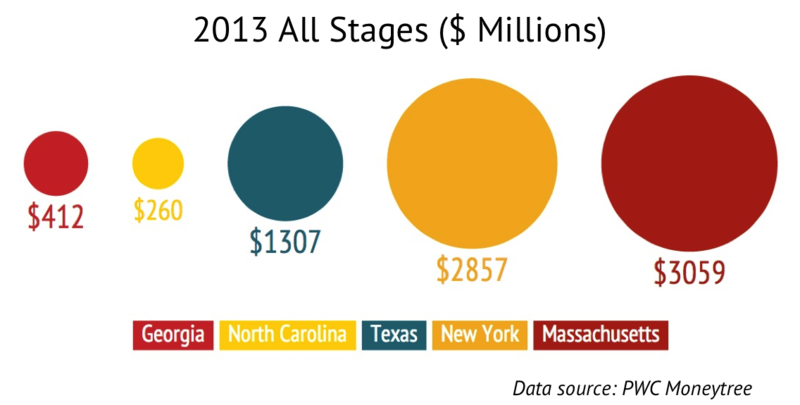 Compared to other technology hotbeds like California, Massachusetts, New York and Texas, access to capital is a critical challenge for Georgia’s tech entrepreneurs. 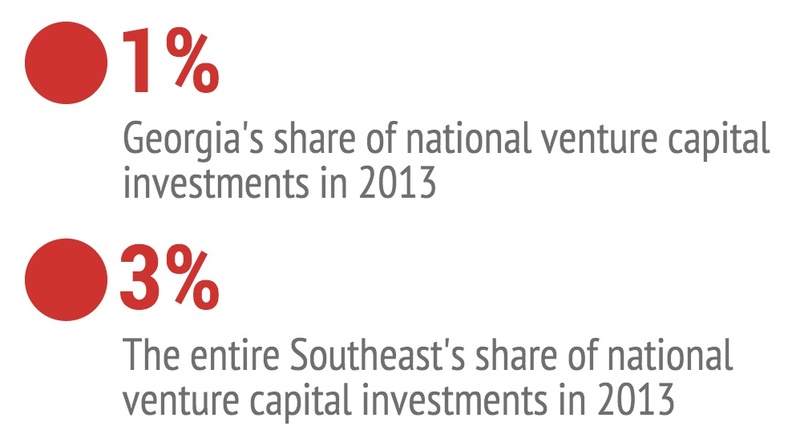 The state’s share of national venture capital investments in 2013 was only one percent, while the entire Southeast saw just three percent of those dollars. Georgia also trails Virginia and North Carolina in seed and early stage investments. The lack of capital is not just a problem for entrepreneurs. It affects all Georgians because when it comes to job growth, startups are everything. A recent study by the Kauffman Foundation highlighted the fact that since 1977, most net new jobs in the United States are created by startups. Improving access to capital is critical for keeping our best and brightest entrepreneurs from leaving the state to find the financing they need. The funding shortage in Georgia is a big opportunity for early-stage venture capital and angel investors. The current level of investment in the state does not match the level of entrepreneurial activity and innovation coming out of our startups and research universities. For local investors, finding deal flow is easier and less competitive here than in other parts of the country. This is why I started Tech Square Ventures, a seed and early-stage fund investing in technology startups. 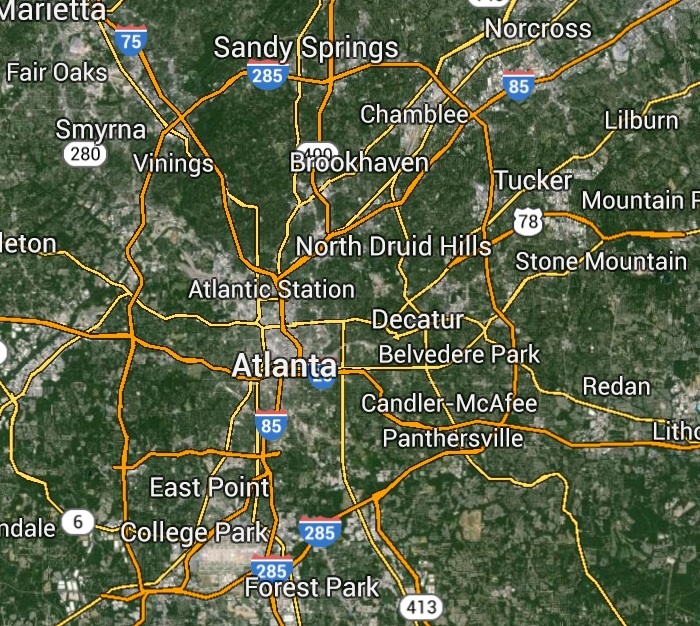 We’re putting our money to work right here in Atlanta and across the Southeast. Investors outside the region are beginning to take notice, as well. Atlanta startups Ionic Security and Pindrop Security both recently raised money from iconic Silicon Valley venture capital firms Kleiner Perkins Caufield & Byers, Google Ventures and Andreessen Horowitz. And last week, Atlanta tech startup hopefuls got their chance. On Oct. 21-22, a full house of local entrepreneurs gathered at the Georgia Aquarium to “swim with the sharks” at Venture Atlanta, the premier technology conference in the Southeast that connects entrepreneurs with the capital they need to grow their business. At the event, 33 local and regional startups presented to more than 125 investors from across the country in hopes of attracting the funding they need to propel them to success. Atlanta has all the key ingredients for a thriving technology startup ecosystem: talented innovators, world-class research universities and a history of startup success. We have a strong base of FORTUNE 1000 companies here, which makes it a great place for entrepreneurs to find early customers and connect with industry executives for networking and mentoring. But, it also takes capital to fuel that ecosystem, and Venture Atlanta is doing its part. When local startups succeed, we all win. This evening I attended Plywood Presents. I had never heard of Plywood Presents until Charlie Paparelli invited me last week to attend as his guest. I went to the event website and to be honest, even after reading the website, I had no idea what to expect. But I love Charlie and he knows me well so I figured I’d give it a shot. I’m glad I did! Plywood Presents brings together entrepreneurs, non-profits, artists, and business people for a TEDx style event focused on social innovation. I saw some awesome speakers, met a lot of passionate and interesting folks, and even had the opportunity to be on the judging panel for their pitch competition. One of the speakers was Jeff Henderson, who gave a talk on how to pitch. What made this presentation unique is Jeff is lead pastor of Gwinnett Church, one of the churches that make up North Point Ministries. Earlier in his career he was in marketing with Chick-Fil-A. His talk targeted the non-profits and social entrepreneurs in the audience who often needed to pitch their ideas for funding. 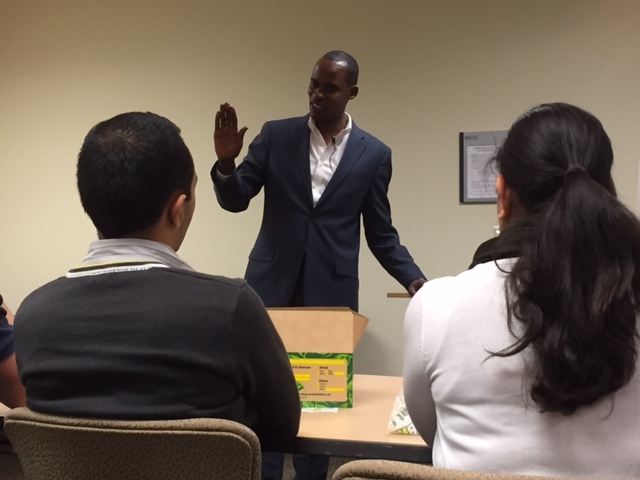 As he gave his talk I quickly realized he’s an awesome communicator – it’s no wonder he has such a following as a pastor! I also realized his advice gives a unique perspective and applies equally well to pitching your startup for funding, so I put together a summary of his key points. Dream big. If your dream outstrips the resources you have to chase it – you are on the right track. If you have all you need, you aren’t dreaming big enough. Great ideas communicated poorly are stalled ideas. Jeff told us how he gives great presentations. First he approaches each presentation with the attitude that his next presentation will be his best. And that’s what he expects. To make that a reality he follows a 3-step process: Prepare, Practice, Present. When preparing he suggested you answer 4 questions before you put together your presentation. What does my audience currently think? What do I want them to think? What is my single most persuasive idea? If you want to give a great presentation you have to record yourself presenting and watch it. Do this 7 times before giving the actual presentation. Use a visual. The human mind starts to tune out after 10 minutes; visuals bring it back in focus. He shared an example from a school presentation his daughter had to give on ovens. She baked cookies ahead of time, asked the audience to close their eyes, and placed a cookie on each students’ desk. When they opened their eyes, she told them to enjoy the cookie and she was going to tell them about how they are made in an oven. I bet she had the full attention of her audience! Edit. The shorter the better. Always end by telling them what you need and asking, “will you help me?” Then shut up. It may feel awkward, but that’s the best way to get a ‘yes’. It was pretty clear he followed his own advice in preparing for his talk at Plywood Presents. I’m going to refer back to his advice before my next presentation – and make it my best. Last month, Urvaksh Karkaria of the Atlanta Business Chronicle was kind enough to write an article (click here to read) on my new seed and early stage venture fund, Tech Square Ventures. The article speculated I might be “stepping onto a crowded field” and had quotes that supported the view that there was no shortage of funding for Atlanta’s entrepreneurs. Several people have asked what I thought about that. Obviously I don’t agree or I wouldn’t be launching a new seed and early stage fund! In an earlier post, Does Georgia Have a Venture Funding Shortage, I pulled together statistics from the PWC Moneytree report to see how we stacked up against other leading tech hubs. With 2013 behind us, I took a look at the latest data to see what has changed. Total investments in Georgia in 2013 were $412 million, up 57% from $263 million in 2012, and ranking Georgia 12th in investments by state last year (up from 14th). Great news right? Not quite. 2013’s number includes $180 million from AirWatch alone. 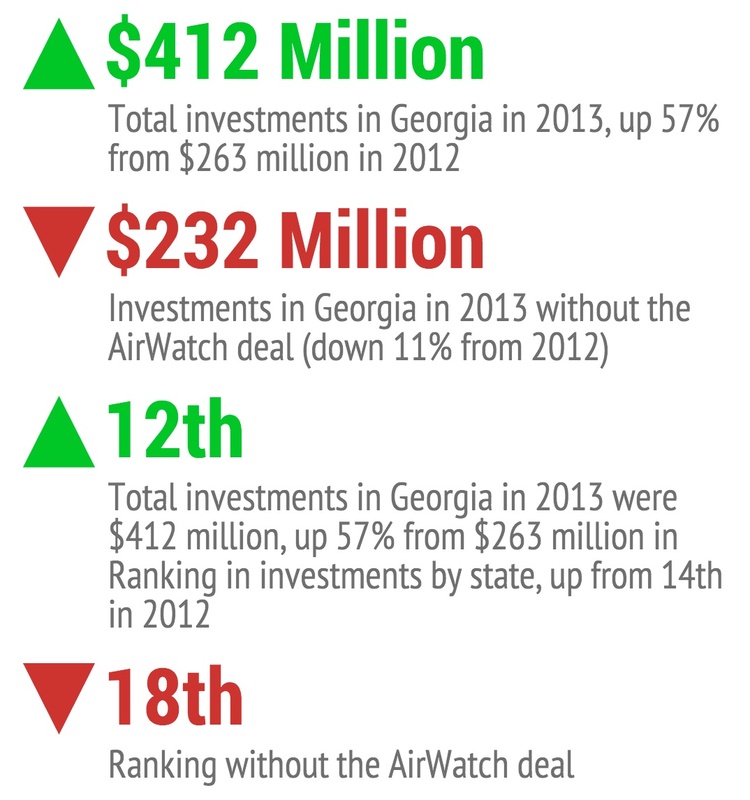 Without the AirWatch deal, 2013 would have been $232 million – down 11% from 2012, ranking Georgia 18th in investments by state. The number of deals was also down 25%. In the previous post I compared Georgia to leading tech hubs North Carolina, Texas, Massachusetts, and New York. I did the same with 2013 data and, like before, I left out Silicon Valley – we already know the answer to that. Among those tech hubs, Georgia lags all but North Carolina in venture investments, and they have up to 7x the amount invested here in Georgia. The root of the problem is more evident when you look at just seed and early stage investments. Georgia lags each of those regions and they have up to 21x the seed and early stage amounts invested here in Georgia. Perhaps more surprising is the fact that Georgia ranks only 4th in the Southeast – trailing Maryland, Virginia, and Florida. 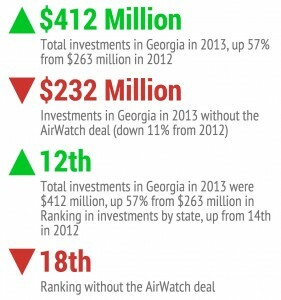 Without the AirWatch deal, Georgia would have been ranked 5th. 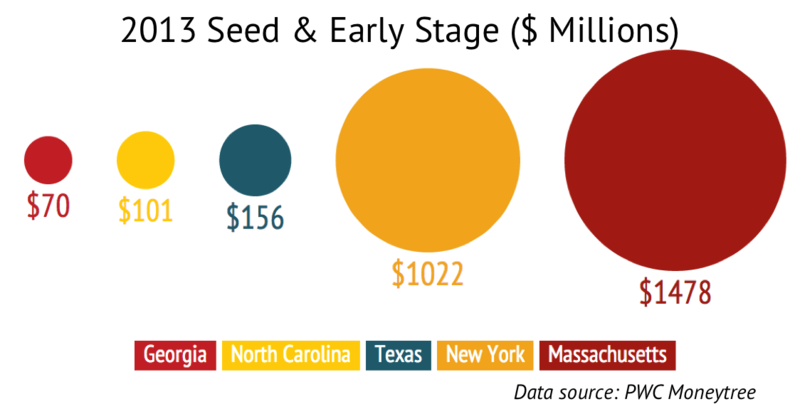 Georgia also ranks 4th in seed & early stage investments behind Maryland, Virginia, and North Carolina. 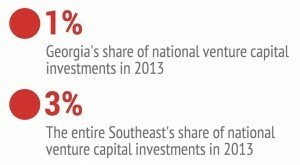 When looking towards the future, one statistic stands out: seed & early stage investments represent 17% of the total amount invested in Georgia, while in all 3 states ahead of us it represents more than 33%. Those states are investing in more robust pipelines going forward. Much of the increase in startup activity we saw in 2013 in Atlanta was essentially ‘pre-seed’ activity. Out of all that activity will emerge a greater number of fundable companies. Crowded field? In this case I think my friend Urvaksh is off base, and the data supports that. I started Tech Square Ventures because I believe the current level of investment does not reflect the opportunity here. In short, I’m betting on our entrepreneurs and area research universities to generate plenty of opportunities for investment. What Neighborhood Are You In? In just the first few weeks since launching Tech Square Ventures, I’ve met one-on-one with 16 startups (some multiple times) and looked at materials from dozens of additional companies. What I have quickly learned is the hardest part of evaluating opportunities is getting up to speed on the specific addressable market the startup serves. Breaking down the addressable market and the specific pain in the market that the startup solves is a challenge with early stage companies. I look to get a handle on the intensity of the pain the solution addresses and the size of the market that has that pain. I look to understand how those customers are solving that pain today (competition). I also look to understand the industry conditions to determine market readiness for change necessary to drive adoption of the startup’s innovative solution. The other night I was talking about this with my wife, Stephanie. We recently moved so I compared it to shopping for a house. Trying to determine the value and opportunity of a startup is like trying to determine the value of a house without knowing what neighborhood it’s in. When you shop for a house, you don’t try to add up the cost of the lumber, drywall, and roofing materials to determine the value. You compare it to other houses in the neighborhood. Without understanding the market and industry conditions, it’s like knowing the details on the house, but not what where it is. Startups that have gone through programs like Customer Discovery and Gauntlet at ATDC, Flashpoint, VentureLab / NSF-iCorps, or other similar programs have a significantly better grasp on their target customer, addressable market, and industry conditions – and they are better at communicating it. When pitching an investor – make sure you help them understand what neighborhood you are in. The cat is out of the bag. Last week Urvaksh broke the news on my new seed and early stage venture fund. I launched Tech Square Ventures to invest in innovative technology startups in the Southeast that have the potential to transform their markets. The $10 million seed and early stage fund will partner with visionary entrepreneurs building startups in sectors that leverage the strengths of the Southeast and our area research universities. While we will be opportunistic in our investment activity, our primary focus will be on information technology and connectivity. In information technology we’ll be looking at SaaS, security, fintech & eCommerce, big data & cloud, and healthcare IT startups. In connectivity we’ll be looking at connected devices, ‘internet of things’, medical devices, sensors, and mobility. Feedback from the startup community and support from local investors has been humbling. I can’t thank everyone enough! In the coming weeks I’ll post more thoughts about the fund, why I launched it, and answer some of the most common questions I’ve gotten since the fund was announced. In the mean time David Cummings posted a great article about the mechanics of a fund this size. While it doesn’t match my plans exactly – it is directionally correct.